This paper proposes a bi-level optimization model about boundary signal control for the network using macroscopic fundamental diagrams. Firstly, the road network is simplified as a directed graph, in which vertices and arcs respectively correspond to traffic zones and road segments connecting zones. Then a bi-level optimization model is proposed and the control objective is maximizing total output vehicles as well as keeping the existing number of vehicles optimal for each zone. The upper layer model optimizes transfer traffic flow among zones and the lower layer model optimizes the signal control scheme about boundary intersections. And a hybrid genetic simulated annealing algorithm is devised to solve the model. Finally, micro-simulation is used to test and verify the validity of proposed model. 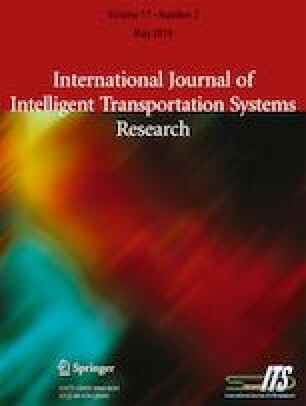 The results show that when the network congestion occurs, especially when traffic congestion is not uniform, the proposed model can improve the output vehicles for the whole network. Simultaneously, the existing number of vehicles in each zone can maintain at nearly optimal level. Thus verifying the effectiveness and feasibility of the boundary signal control model.